If you are searching for something new and different in fiction, you might try Catherine Lacey. 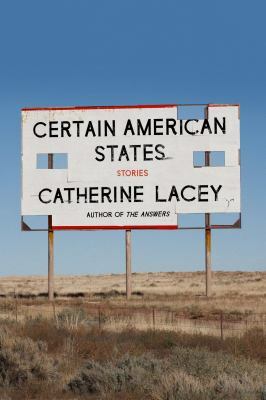 I’m at the point where I would rather read her disordered unpredictable stories in ‘Certain American States’ than the simpler more straightforward sincere stories of someone else. This is my first encounter with Lacey’s work, but it won’t be my last. So what makes Catherine Lacey’s stories so peculiar? It is the outlandish unpredictable twists that occur along the way. None of the stories are written in chronological order but skip around as needed to heighten their impact. Also Lacey writes superb, occasionally extraordinarily long, sentences. These are the kind of sentences and stories you want to read more than once to capture their full meaning. In fact the first sentence in the first story is nearly two pages, nearly perfect except the editor of my edition left out a ‘to’ early in the sentence. “You have been calling and hanging up. I know it’s you. The telephone rings differently when you call. A reader can never tell if Catherine Lacey is serious, and it is probably wise for you to assume she is not. My main complaint with Lacey’s works here is a a lazy one. These stories each contain so much that they are simply exhausting. A reader shouldn’t have to work this hard in order to enjoy a story. These are the kind of stories that you may want to re-read, but that you may also need to reread in case you have missed a key point. Even in the stories that misfired for me there were a sense of humor and plenty of interesting ideas. Yup… “simpler more straightforward sincere stories” don’t often hold much interest for me any more. IMO there are too many books around which are written by someone who has nothing original to say. I do not agree with those who say that ‘everyone has a story to tell’. I would say that not everyone has a story worth telling, or worth the time of those expected to endure it politely. IMO it is narcissism which drives too many novelists today. They think that their love lives, their motherhood, their careers are different and special, when they are not, but they are published because other narcissists want to ‘connect’ with characters. Forgive me if I sound brutal. I am feeling liverish. I have just glanced at some consumer reviews of a book which tells a story of people surviving the Siege of Leningrad and I am wondering what kind of shallow person can’t empathize with anything beyond their own complacent existence and sums it up as “awfully dull”. What I don’t like is when they count the number of positive reviews to determine the quality of a fiction. That means nothing to me. Very occasionally the subject of a fiction enters into my decision to read, but only if the word is that it is well-written. Yes, I think that’s a sound approach to take. Obviously some opinions count more than others! I add my reviews to Goodreads and follow selected reviewers there because I found some very reliable reviewers there who don’t blog, but (just as I very occasionally look at online newspaper comments and then regret it) I do sometimes look to see why, when a star rating is very different from mine. And I shouldn’t do it, because it usually just makes me cross! Yes, GoodReads is a fine place to get the real opinions about a book, not some author who might be friends with the writer or have the same publisher. I expect even Shakespeare would get some negative reviews at GoodReads. Probably the biggest fault in book reviewing now is that we all too easily praise too many books. Ah, I think GR is vulnerable (like Trip Advisor) with reviews not to be trusted, but not quite as tainted as Amazon which is notorious for authors trying to rig the ratings. Unless they are accompanied by a thoughtful review from someone who knows what they’re talking about, I generally distrust both the 5-star “honest” reviews written in exchange for a free book and the 1-2 star reviews which tend to be either ignorant or vindictive. It’s mostly when I occasionally stray into bestseller territory that I don’t know any of the reviewers and so come across dubious reviews. Yes, when there is a lot of money and prestige riding on great reviews, there are always someones willing to provide great reviews. That’s why it is so pleasurable and significant for me when a writer who never got much acclaim during their prime finally gets discovered. I love the quotes you’ve provided Tony – she sounds like my sort of writer. You have a point about having to work hard – there’s a line there isn’t between having to work too hard and not having to work at all. I was going to read Catherine Lacey’s novel ‘The Answer’ but never quite got to it, so I read these stories instead. Catherine Lacey does seem to be unique and profound above the crowd. Your point of not working too hard to understand a novel and not working at all seems valid. There are novels that are just too obscure and others that have nothing that is unique. Strangely, I’d never heard of Lacey until your post and then in the same day she popped up on someone’s Instagram account. She probably wouldn’t have registered if I hadn’t read your post.